"The 28 bottle wine refrigerator options is not available to California due to California Energy Commission Energy Efficiency standards which regulates the appliance maximum annual energy consumption (kWh). What is the height of the drawers? Can it hold wine glasses. Would a wine fridge 33" H, 22" D, 20.5" W fit in this unit? BEST ANSWER: The Mesa Sliding Barn Door Cabinet With Wine Refrigerator can accommodate a fridge as large as 29 1/2 inches. It is important for the wine fridge to have plenty of room to vent properly. Is the wine fridge included? BEST ANSWER: Elizabeth, yes you can order this cabinet with one of the following 3 wine fridges: 28 Bottle Wine Refrigerator, 20 Bottle Evolution Wine Refrigerator, and the Evolution Series Wine and Beverage Center. We do also sell the cabinet alone if you would prefer to purchase it with out a wine refrigerator. I’ve heard many responses. Does the price listed include the cost of the fridge or is the fridge an additional cost? 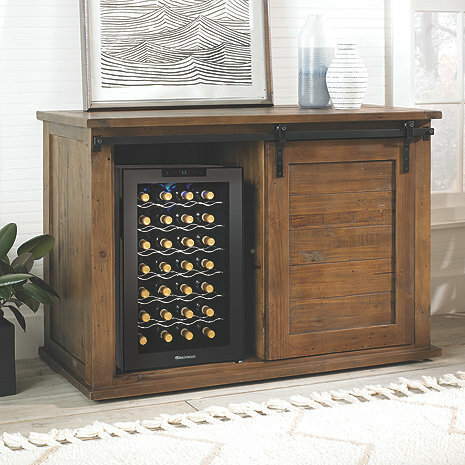 Yes, on this page ( https://www.wineenthusiast.com/mesa-sliding-barn-door-cabinet-with-wine-refrigerator.asp ) the price includes any one of the fridges you would like. Yes. I ordered the one with two on each end. They are beautiful and work very well. I recommend the purchase. No, you purchase it separately. We bought 2; one for each side; red and whites. Yes it’s included. Just make sure the one you pick can delivered to your state. Yes, 2 - 28 bottle refrigerators. If purchase with wine cooler, is there any storage besides the drawers? BEST ANSWER: There are two shelves and the racks for red wine. The two shelves are very large and can accommodate lots of items. I have purchased rollout drawers to install on the shelves as they are very deep and these will, I hope, ease item retrieval. Are the shelves where the cooler goes or in addition to that space? Absolutely! I purchased without but even with it you’ll have plenty of room. Left side I use for a stereo recover and the middle I have wine bottles. There’s more room below the receiver that I do not use. What's the lowest temperature the beverage center reaches? BEST ANSWER: Ours is kept at 55*. It can be lowered to 52* if desired. We have another wine fridge for wines we want kept at 42*. We absolutely love our barn door cabinet. We get many compliments on the look. Wishing you as much happiness with your purchase as we have experienced. just to be sure, I am talking about the beverage fridge not the wine. The wine cooler goes lower than the beverage center? you said your wine fridge is kept at 42? 52 degrees doesn't seem very cold for beverages. The unit comes with a wine fridge and is it put in place with the white glove delivery? Can i Buy only the Credenza without the fridge? We really love the wine fridge! It's good looking, goes well with our other furniture and my husband says the cooler is great. The two great guys who delivered it and set it up were very pleasant, knowledgeable and made certain we were pleased. A very good experience! Great piece to work as our butler/wine pantry area. Bonus to include the wine fridge! Nice piece for the money, just wish it was a little more quality of wood material. Overall happy. I would recommend this product. I love the wine hutch in looks and use. Lots of compliments on it. Words cannot express how perfect and beautiful this credenza is, it completed my family room and every who has seen it is totally impressed. If you are thinking about ordering this- then order it now:) So happy we did!! Beautiful piece of furniture and wine fridge works perfectly:) I absolutely love this piece! 100% satisfied with everything about purchasing this item- from the ease of ordering to the delivery. The construction is solid, definitely well made. It is absolutely gorgeous. The online picture does it justice. No comment on the function of the wine fridge as of yet. I only just received it today. All I can say is that it looks lovely inside the credenza. I love the sliding barn door so I can hide it away if I want. The cabinet is awesome! Love it! The fridge is really a cellar though, and doesn’t chill below 52 f.